A recent article published in Harvard Business Review shared the results of a research study that discovered 4 specific practices that greatly increase a leader’s ability to shift into the productive state of mind that they refer to as ‘CHE – calm, happy and energized.’ They call these practices the ‘4 step reset’. What was important about this research, was that consistency and combination were the real keys to success. Following this sequence – in order and often – what was contributed favourable to a shift in mood. Previous studies showed that many professionals had mixed results when they used these practices separately or infrequently. As a result, more than half of them couldn’t shift their states of mind when they needed to. 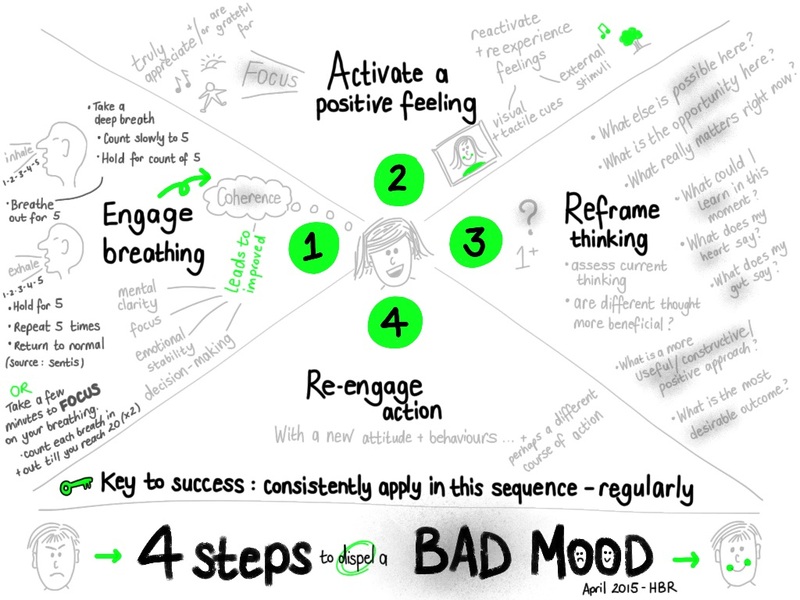 But following these 4 steps – in order – helped leaders shift their state of mind and create sustainable change in their emotions, words and deeds.